There’s no denying that men are oppressed by certain cultural norms. These tell them that they shouldn’t openly express their feelings, that there is only a very limited way to perform masculinity in an ‘acceptable’ way and that disagreeing with dominant tropes about what is and isn’t ‘manly’ can lead to very unpleasant consequences. I read No, Seriously, What About Teh Menz and agree with a great deal of what is said there, about men, ‘manliness’ and the problems unique to men in a patriarchy. I also find Tony Porter’s TEDWomen speech on the pernicious and damaging “man box” to be moving, and accurate, and highly pertinent. 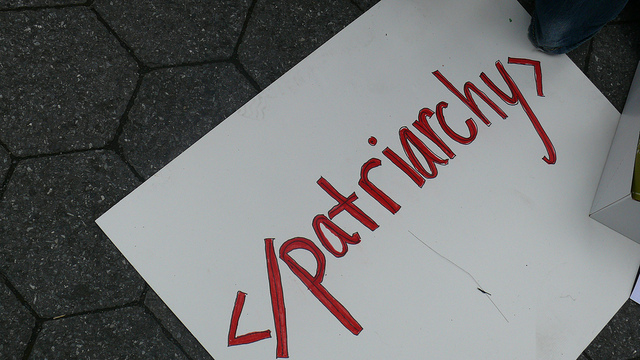 Picture shows the HTML for “end patriarchy” written in red pen across a white sheet that is placed on a pavement and tilted diagonally upwards into the top righthand corner. By ctrouper. Shared under a creative commons licence.